[A new NSA document revealed in Germany's Bild newspaper said there was a] "... not legally registered spying branch" (illegal under German law) in the US embassy in Berlin, the exposure of which would lead to "grave damage for the relations of the United States to another government". Germany and Brazil are spearheading efforts at the UN to protect the privacy of electronic communications. Diplomats from the two countries, which have both been targeted by the NSA, are leading efforts by a coalition of nations to draft a UN general assembly resolution calling for the right to privacy on the internet. Although non-binding, the resolution would be one of the strongest condemnations of US snooping to date. "This resolution will probably have enormous support in the GA [general assembly] since no one likes the NSA spying on them," a western diplomat told Reuters on condition of anonymity... The Associated Press quoted a diplomat who said the language of the resolution would not be "offensive" to any nation, particularly the US. He added that it would expand the right to privacy guaranteed by the international covenant on civil and political rights, which went into force in 1976. The draft would be sent next week to the general assembly subcommittee on social, humanitarian, cultural and human rights issues, and be put to the full general assembly in late November. Germany and France demanded on Thursday that the Americans agree to new transatlantic rules on intelligence and security service behaviour by the end of the year. Merkel added that she wanted action from Obama, not just apologetic words. Viviane Reding, vice president of the European Commission, called for EU nations to commit to adopting a data protection law in light of the recent spying scandals. "Data protection must apply to everyone -- whether we are talking about citizens' e-mails or Angela Merkel's mobile phone," she said. "We now need big European rules to counter big fears of surveillance. "At the summit today, Europe's heads of state and government must follow words with action: They should commit to adopting the EU Data Protection Reform by spring 2014. This would be Europe's declaration of independence. Only then can Europe credibly face the United States." A delegation of nine MEPs (members of the European parliament) will travel to Washington on Monday for a three-day visit, during which they will press senior US government and intelligence officials for answers on allegations of widespread spying by the US, and explore "possible legal remedies for EU citizens" resulting from the alleged surveillance. Defense Minister Thomas de Maizière, gave full voice to the shock expressed by politicians and citizens. Reuters brought up the particularly sensitive issue of East Germany's infamous secret police, the Stasi, curbed only two decades ago, which had arguably the most intrusive spy machinery in the Soviet bloc. BBC says the German anger is intensifying and the response in today's papers "blistering." Had President Obama told the truth about NSA surveillance previously, to his own citizens, perhaps European leaders would trust him now. The Washington Post listed some of his lies back in August. Watch him lie on the Tonight Show. The New Republic goes into the flimsy legal arguments now being twisted to justify a level of surveillance whose scope was even hidden from the FISA court, according to its chief Justice, Reggie Walton. Australian embassies are being secretly used to intercept phone calls and data across Asia as part of a US-led global spying network, according to whistleblower Edward Snowden and a former Australian intelligence officer. The top secret Defense Signals Directorate operates the clandestine (US) surveillance facilities at embassies without the knowledge of most Australian diplomats. StopWatching.us is a coalition of more than 100 public advocacy organizations (especially the Electronic Freedom Foundation) and groups from across the political spectrum. Join the movement at https://rally.stopwatching.us. This video harnesses the voices of celebrities, activists, legal experts, and other prominent figures in speaking out against mass surveillance by the NSA. Please share widely to help us spread the message that we will not stand for the dragnet surveillance of our communications. The Electronic Frontier Foundation (EFF) is a nonprofit civil liberties law and advocacy center that has been fighting the NSA's unconstitutional spying for years. Learn more at https://eff.org. We discover here the proof of the existence of the GENIE programme, one of the most topical in the NSA: the remote delivery of spyware to computers... The document specifies the techniques used to spy on the communications of the French diplomats: 'Highlands' for pirating computers using remotely delivered cookies; 'Vagrant' for capturing information from screens; and finally PBX which is the equivalent of eavesdropping on the discussion of the French diplomatic service as if one was participating in a conference call - as the Spiegel first reported. Some of the techniques developed are known to other secret services but like all the major secret services in the world, the NSA also creates its own tools which do not exist anywhere else. It can be seen that over a period of thirty days – from 10 December 2012 to 8 January 2013, 70,3 million recordings of French citizens' telephone data were made by the NSA. This agency has several methods of data collection. According to the elements obtained by Le Monde, when a telephone number is used in France, it activates a signal which automatically triggers the recording of the call. Apparently this surveillance system also picks up SMS messages and their content using key words. Finally, the NSA apparently stores the history of the connections of each target – or the meta-data. (CNN) -- You've never heard of XKeyscore, but it definitely knows you. The National Security Agency's top-secret program essentially makes available everything you've ever done on the Internet — browsing history, searches, content of your emails, online chats, even your metadata — all at the tap of the keyboard. The Guardian exposed the program on Wednesday in a follow-up piece to its groundbreaking report on the NSA's surveillance practices. Shortly after publication, Edward Snowden, a 29-year-old former Booz Allen Hamilton employee who worked for the NSA for four years, came forward as the source. This latest revelation comes from XKeyscore training materials, which Snowden also provided to The Guardian. The NSA sums up the program best: XKeyscore is its "widest reaching" system for developing intelligence from the Internet. The program gives analysts the ability to search through the entire database of your information without any prior authorization — no warrant, no court clearance, no signature on a dotted line. An analyst must simply complete a simple onscreen form, and seconds later, your online history is no longer private. The agency claims that XKeyscore covers "nearly everything a typical user does on the Internet." I've wondered why Dianne Feinstein so persistently defends NSA and other surveillance abuses. Now she is proposing a bill designed to avoid reining in these abuses--an attempt to circumvent other, more substantive bills such as that of Jim Sensenbrenner and Pat Leahy--and yesterday she penned a paean to surveillance in USA Today that, more than anything, sounds like it was written by a robot. On Oct 2 The Hill wrote about Feinstein's plan to save surveillance in a story titled, Feinstein Vows to Kill Leahy's Bill. As head of the Senate Intelligence committee, she is one of only eight Congresspeople who gets highly classified intel briefings, and is the top legislator responsible for oversight of US intelligence gathering. Don't you think her communications were the first to be collected? The way she slavishly carries NSA's dirty water shouts "blackmail". She has a lot to lose. Her Senate disclosure lists assets of between 43 and 99 million dollars, making her the fifth richest US Senator. How many of our elected representatives have not a single skeleton in the closet for the intelligence agencies to exploit? “The modest improvements [the bill] makes are far outweighed by the damage it does to civil liberties,” said Greg Nojeim, of the Center for Democracy and Technology. Thanks Diane. I mean Big Sister. UPDATE from TechDirt: How Feinstein's bill would legalize NSA spying, and it includes a copy of the bill. How does NSA avoid the legal restrictions that exist in FISA (the Foreign Intelligence Surveillance Act) regarding data collection on US persons? The Post article is explicit about how the law is trampled by collecting the data on Americans from outside the US: from non-US nodes in the worldwide internet. And who maintains the web architecture that routes your communications through overseas nodes? Now you know why the internet itself is provided for free, courtesy of the US government. BBC points out this information "is particularly significant because President Obama has previously said that US citizens were not targeted by the surveillance, which he said struck "the right balance" between security and privacy." UPDATE: A WaPo video shows Obama minimizing extent of NSA surveillance in June, denying collection of content. Elsewhere, he denied spying on Americans and those who live in America, but I cannot find that WaPo clip. According to the WaPo, NSA Director Keith Alexander is another purveyor of Big Lies. UPDATE: And another BBC piece from September: The US National Security Agency (NSA) is reported to have cracked the security codes which protect data on iPhones, Blackberries and Android devices. The NY Times details how (borrowed) federal money spares no expense to equip US cities to achieve a level of surveillance of citizens thought only possible in science fiction, i.e., George Orwell's dystopic 1949 novel, titled 1984. Here. Now. In America. OAKLAND, Calif. — Federal grants of $7 million awarded to this city were meant largely to help thwart terror attacks at its bustling port. But instead, the money is going to a police initiative that will collect and analyze reams of surveillance data from around town — from gunshot-detection sensors in the barrios of East Oakland to license plate readers mounted on police cars patrolling the city’s upscale hills. The new system, scheduled to begin next summer, is the latest example of how cities are compiling and processing large amounts of information, known as big data, for routine law enforcement. And the system underscores how technology has enabled the tracking of people in many aspects of life. The police can monitor a fire hose of social media posts to look for evidence of criminal activities; transportation agencies can track commuters’ toll payments when drivers use an electronic pass; and the National Security Agency, as news reports this summer revealed, scooped up telephone records of millions of cellphone customers in the United States. Like the Oakland effort, other pushes to use new surveillance tools in law enforcement are supported with federal dollars. The New York Police Department, aided by federal financing, has a big data system that links 3,000 surveillance cameras with license plate readers, radiation sensors, criminal databases and terror suspect lists. Police in Massachusetts have used federal money to buy automated license plate scanners. And police in Texas have bought a drone with homeland security money, something that Alameda County, which Oakland is part of, also tried but shelved after public protest. ... Microsoft built the technology for the New York City program. I.B.M. has sold data-mining tools for Las Vegas and Memphis. The city has maintained that the expanded surveillance is necessary to keep society safe. No one in the Bloomberg administration has discussed the limits on their participation in public dialogue. Or, for that matter, why they ought to be standing alongside people handing out bags of groceries. USA Today points out that in one day, the NSA amassed over 400,000 email address books from yahoo customers. Nothing personal, you understand. I guess NSA just wants to know everyone you know, because they can. By now, it should be obvious that everything you send electronically is being scooped up, and probably connected with many other bits of information about you, including your whereabouts, your car, your banking, your friends, and your purchases. What's left? Think those skeletons in the closet are still secret? Russell Tice, a 20 year NSA veterans, says they scoop up every word of your phone calls, faxes, texts, etc. in a PBS interview. NSA wiretapped many major politicians, of which he had personal knowledge and evidence. This included Supreme Court judges, Senators and Representatives, especially those who were responsible for intelligence oversight, like Senator Feinstein. Full text information is being digitized, recorded and archived, according to Tice. However, the NSA general counsel says NSA does not do a "Hoover-like" collection. Who do you believe? (i)There are no studies showing that healthcare workers are at increased risk of influenza and its complications or that the vaccine is more effective in this group. (ii)The evidence base for the claim that vaccinating healthcare workers against influenza protects their patients is heavily flawed and inconclusive at best. (iii)The benefit from vaccinating healthcare workers, if any, may differ according to specifics of the patients, location, and worker. (iv)At present, the decision whether to get vaccinated should, except possibly in extreme situations, be that of the individual healthcare worker, without legal, institutional, or peer coercion. The severely biased conclusions of these articles are the crux of the “proof” presented by authorities supporting HCW vaccination. It is somewhat depressing to see the prejudiced manner in which the literature can be presented, as illustrated by the 2010 CDC advisory committee on immunization practices recommendations on HCW vaccination. The above reviewed flawed studies are presented by this committee as evidence and further support is added by stating: “a review concluded that vaccination of HCP in settings in which patients also were vaccinated provided significant reductions in deaths among elderly patients from all causes and deaths from pneumonia.” This statement does not correctly represent the referenced 2006 review which presented the flawed data from the two studies published at that time but actually concluded, very differently, that “…an incremental benefit of vaccinating health-care workers for elderly people has yet to be proven in well-controlled clinical trials”. We conclude there is no evidence that vaccinating HCWs prevents influenza in elderly patients in long term care facilities." This important and unambiguous conclusion was disregarded by the CDC committee in their recommendations,** published six months later, favoring HCW vaccination." ** CDC, “Prevention and control of influenza with vaccines: recommendations of the Advisory Committee on Immunization Practices (ACIP),” Morbidity and Mortality Weekly Report, no. 59, pp. 1–62, 2010. Libyan Prime Minister Ali Zeidan has called on Western powers to help stop the spread of militancy in his country. Speaking to BBC Newsnight before the capture of Mr Liby, Mr Zeidan said that the huge proliferation of weapons in Libya poses a serious security threat.Continue reading the main story"Weapons are being smuggled out of and into Libya by groups which are trying to murder and assassinate people, and spread terror in the country," he said. Proliferation is not just a concern for Libya but for its neighbours too. Western intelligence agencies believe Libya now has the largest unsecured stockpile of weapons in the world, with millions of tons of arms unaccounted for since the 2011 revolution that toppled Muammar Gaddafi. They include 3,000-8,000 so-called Manpads - Man Portable Air Defence Systems - portable missile systems which are a threat to all types of aircraft, including civilian passenger planes. These surface-to-air missiles, which are easy to use and easy to hide, are the weapon of choice for groups like al-Qaeda, say security experts. The Times titled this article: In Test Project, N.S.A. Tracked Cellphone Locations. Of course, having proved that they could use our phones to track us, they stopped doing so. 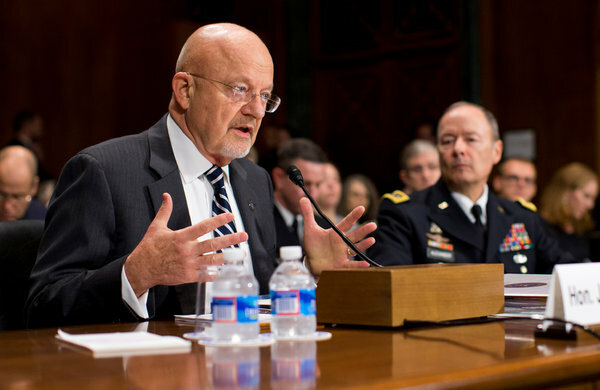 I'll believe anything that Director of National Intelligence James Clapper says, because if he tells a bald-faced lie about surveillance of US persons he will only be telling me (like he told Congress) the "least untruthful" thing he could say. But Senator Ron Wyden, an Oregon Democrat who receives classified briefings as a member of the Intelligence Committee and who has raised concerns about cellphone location tracking, said in a statement that there was more to know about the matter than the government had now declassified. Wonder if they have hooked up control of drones to the cellphone tracking of US persons? Probably only overseas, right? So far. ... WildCat can bound, gallop and turn, mimicking the movements of quadruped animals. It is powered by an internal combustion engine. "It is a shame that such technology is not being developed with other research funding," said Prof Sharkey, who is also chair of the International Committee for Robot Arms Control. 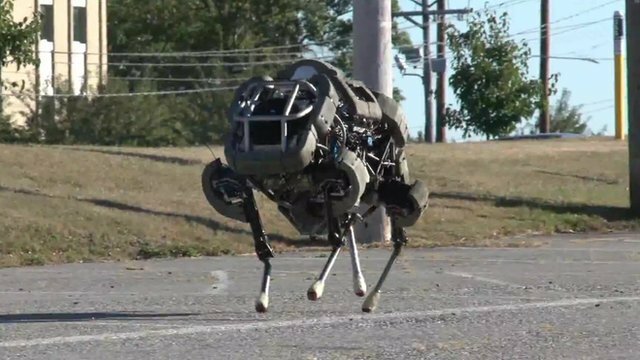 "We do not know what military purpose it will serve but certainly it is a step towards a high-speed ground robot that could be weaponised to hunt and kill."